Riley, who is white, has served an astounding 10 terms, in part by treating Charleston’s racial history with delicacy and respect. Among other things, he promised to open a museum to honor all the slaves who came through the city—40 percent of all those brought to North America. And since he first took office in 1975, the mayor has been a staunch proponent of tourist-related development downtown, which is now a mixture of sleek new shops, high-end hotels and restaurants, and historic buildings. But that tourism still relies on the “old South charm” of the city, an almost unconscious yet eerily apparent marketing of the city’s white-supremacist past and its roots in slavery. One of the most popular attractions downtown is the Old Slave Mart. There is an admission fee to enter. There is far less tourism surrounding those who struggle against this legacy. The Gullah-Geechee people (who descended from the slaves on the sea islands and still speak a distinct dialect) sell sweet-grass baskets around the city, and they’ve enjoyed some progress: A Gullah-Geechee Cultural Heritage Corridor was established in 2007. In 2014, the city unveiled a statue to Denmark Vesey, a freed slave who began the formal resistance to the white supremacy that dominated the state. There has rightly been a lot of attention paid to Vesey in the days since the attack on Emanuel AME, the church he’d helped establish nearly 200 years earlier. But I thought of Gullah Jack Pritchard, another conspirator,as I walked past the historic tourist attractions downtown towards another event, a few blocks from Emanuel AME, called “Burying White Supremacy” and organized by Black Lives Matter Charleston. Pritchard, who was executed along with Vesey in 1822, was a conjurer (or “root doctor”) who used African folk magic (or “hoodoo”) to recruit those slaves who may not have accepted Vesey’s Christianity. While Vesey worked within the church, Pritchard operated outside of it, giving conspirators magic charms to use against the slave owners they meant to kill before fleeing to Haiti. But this “full-frontal” organizing is precisely what’s so difficult to actualize in gentile Charleston, as the relationship between the city’s government, churches, and residents grows increasingly thorny and contentious. “Joe Riley is pretty much at war with us,” says d’Baha, gesturing at the police directing traffic towards the auditorium across the street, where thousands were still gathering. “He’s managed to organize our churches better than we organize our churches.” This is significant because in Charleston, the churches rule, and the mayor has their support. Given the fact that Roof’s racially targeted massacre occurred in one of the oldest and most revered of the city’s black churches, something feels off. In some ways, the whole city is coming together in grief this time—after all, in this instance, it wasn’t a cop who shot the nine church members, and when North Charleston police officer Michael Slager was filmed shooting Walter Scott in the back in April, charges were quickly brought against him. (He’s now in a cell besides Dylann Roof.) But despite those charges, the community is still reeling from Scott’s death, then just the latest example of a police officer killing an unarmed African American, and triggering national pain and outrage. It is even more disturbing when the primary imperative in Charleston, according to d’Baha, is “Don’t disturb the tourism.” This sentiment had also held sway in cities such as Baltimore, where, in the protests surrounding the April death of 25-year-old Freddie Gray, police became far more confrontational when protesters approached the tourist areas of the Inner Harbor and Camden Yards. “That’s the real battlefield,” d’Baha says. It’s an unsettling problem when the expression of grief serves to solidify the very power structure that preserves the city’s legacy of white supremacy, of which Roof’s massacre is only the latest expression. And for me, someone who grew up in South Carolina but now lives in Baltimore, the scene of the mayor hosting a packed auditorium and garnering standing ovations while a Black Lives Matter organizer stands alone beneath the statue of a white supremacist was surreal. If 2,000 people were in a room with Baltimore’s black mayor right now, she would probably have to be surrounded by guards. 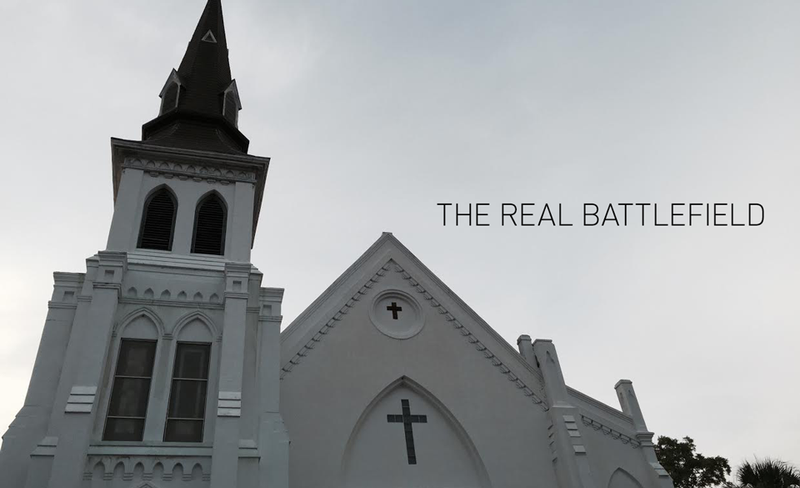 But as Roof’s choice to target Emanuel AME shows, religion is still extremely powerful in this city. And according to d’Baha, Mayor Riley has successfully enlisted the black churches in maintaining order. Black Lives Matter describes itself as “a national network initiated in 2013 after the acquittal of George Zimmerman in the murder of Trayvon Martin.” The organization mobilizes in various cities around the country after events of major significance, such as the shooting of Mike Brown by Ferguson, Mo., police officer Darren Wilson or Freddie Gray’s death while in the custody of Baltimore police. But the movement works in smaller ways all around the country, trying to build a counter-narrative to a civic structure that, in thousands of small ways, places white lives above black lives and that places certain black lives above others. For many, the racist attack on the congregation of a revered black church—killing Rev. Clementa Pinckney, who was not only a pastor but a state senator—spells out the end of respectability politics, or the idea that if black people would just behave and pull their pants up, the white supremacists and the police would leave them alone. Back on Friday night, d’Baha remained alone under the statue while the mayor and the ministers had long since begun packing the house up the street. “This is a story that they very much want to control,” he explained. “It’s really up to us to present a counter narrative.” Part of his “burying white supremacy” campaign wants to make it clear how so many of those tourist landmarks in Charleston “uphold the stature of white supremacy.” He needn’t go far for examples—Francis Marion, for whom the square we were standing in was named, owned slaves, and Calhoun, whose statue loomed over d’Baha, vocally espoused white supremacy. But, in Charleston, where the movement to secede from the Union began, it is hard to walk a block without such a reminder—even the Emanuel AME church sits on Calhoun Street. D’Baha’s position seems to be gaining some traction. South Carolina Governor Nikki Haley called this week for the Confederate battle flag to come down from the grounds of the State Capitol, while cities as far away as Baltimore are talking about changing the names of parks and buildings named after Confederate leaders. In Charleston, “Black Lives Matter” has been spray-painted on a nearby Confederate monument to “The Defenders of Charleston—Fort Sumter.” There has been other progress as well. Black Lives Matter Charleston has demanded widespread reform, especially regarding police interaction with citizens—including body cameras, a review of the department, and a diversity task force. “We’re presenting the plans to City Hall,” d’Baha says, “and we’re going to be running a slate” for political office. D’Baha’s difficulties show the stark line in Charleston between accepted, sanctioned mourning and radical protest. Deray McKesson, an activist and protestor who has become a national voice for Black Lives Matter and other organizations, was also in the city for the vigil and surrounding protest: A former school administrator from Baltimore, he has used social media to galvanize what might otherwise have been isolated struggles in cities such as Ferguson, New York, and, after the shooting of Walter Scott, North Charleston. His presence, following tragedy after tragedy, has come to signify a grass-roots presence in ongoing struggle against police violence and white supremacy—drawing crowds, and increased media scrutiny. As Black and McKesson stand in front of Emanuel AME church with the hundreds of people who had migrated over after the mayor’s vigil and waited to place flowers on a makeshift memorial, a white man in a kilt began to play a bagpipe, and everyone started singing “Amazing Grace.” It was a moving scene, sad and profound, but there was also a certain kind of joy, a carnivalesque feeling to the gathering. The Omega Phi Psi fraternity moved around in purple shirts passing out bottles of water in the stifling heat. CNN’s Anderson Cooper and MSNBC’s Chris Hayes stood off to the side bathed in bright lights. Various people started gospel songs. Everyone fell quiet as someone began to preach. There were a couple white guys wearing #BlackLivesMatter shirts standing beside McKessen; I did not see Joe Riley or Muhiyidin d’Baha. Though the mayor and the churches have garnered the support of the elite, those who are struggling most may be drawn to d’Baha’s message of more radical change. On Tuesday morning, it was discovered that the John C. Calhoun statue was spray-painted; below the monument’s declaration championing “Truth Justice and the Constitution,” the words “And Slavery” were added. The word “Racist” was scrawled under Calhoun’s name. A homeless man who stops often in the park talked to me about what it would take to bring the Calhoun statue down. (Surely more than some graffiti.) As another man, Jason Cunningham, passed through the park, he turned to d’Baha and said, “You know what time it is.” Then he began to talk. As Cunningham finished, d’Baha turned back to me. “Guess we got our ceremony after all,” he said. Baynard Woods is the author of “Coffin Point: The Strange Cases of Ed McTeer, Witchdoctor Sheriff” and Editor at Large of the Baltimore City Paper. Photos courtesy of Baynard Woods.